Time: 1.15 pm (duration around 1 hour). Food available from 12.30pm. Venue: No. 8 Café, Westgate Street, Launceston (no. 6 on the Festival venues map ). Please note : There are 10 steps up to the Festival event area, and there is no wheelchair access. 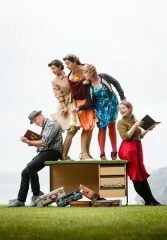 The Story Republicans have an ever-expanding repertoire of tales, poems and Cornish folk songs, which they perform to audiences throughout Cornwall. Versatile and skilled in commanding all kinds of spaces, they have performed on ferries, in fields and at festivals as well as beaches, harbours and stately homes and castles. They are captivating, colourful, playful and uplifting.